Kaikai Kiki Gallery is pleased to announce Austin Lee’s very first show in Japan. The opening will take place on Friday, March 3. Born in 1983, Austin Lee has received a lot of attention as a digital native artist who is fully proficient in transcribing pixel data, a daily norm in his generation, into paintings imbued with a certain digital sentiment. He was selected as one of the “10 Emerging Artists to Keep on Your Radar” on artnet news in November 2016, in which they described the 10 artists who made it on the list as those who work “with the potential to shape the future of contemporary art”. Lee’s works, which are mostly generated from digital sketch on the iPad, possess a highly contemporary visual language composed of doodle-like contours, flat graphic lines, and compositions in which the 2D and 3D coexist. “I think I probably have been using Photoshop a lot longer than I’ve been painting, so for me, Photoshop is a natural way of solving problems.” These are the words of the artist whose artistic process seems to reflect the ever fluid identity of the contemporary human being that constantly oscillates between the virtual and the real. Making a painting involves a lot of doing and thinking. Looking at a painting is a lot of looking and thinking. A vehicle for thoughts reflecting the world and people around it. Austin Lee is a young artist who produces his works utilizing tools and software such as iPad and ZBrush. There is a certain mysteriousness to him; for example, he used to be a boxer before becoming an artist. Lee has a very profound style wherein a mushy and untidy finish and apparent casualness in his choice of subjects together constitute a glimpse into the complex structure of human brain. Yet, I know his work will strike lay people as something shallow and simple that could have easily been created by anyone. And I think that’s okay, because professionals and ordinary people see works of art from totally different perspectives. As professionals, we always try to pin down the core values of the artist. Lately, there is much discussion about the state of Artificial Intelligence as it increasingly dominates the field of “brain games” such as Western/Japanese chess and the game of Go. It isn’t hard to imagine it reaching out its ominous hand to the field of art before long. Lee’s work, however, has a sense of resilient fluctuation that will allow him to playfully escape the evil hands of AI. 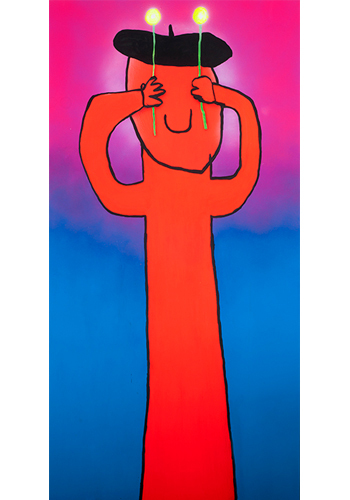 Not only that, a painting by Austin Lee in your office will be sure to make everyone smile. I hope you will come see his work in person and discover the seriousness with which the artist engages in his creative process.